rehab touch from Meng Shi on Vimeo. 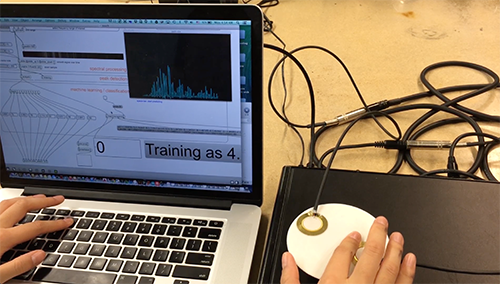 The idea of the final project is to explore some possible way to detect people’s gesture when they touch something. Stroke affects the majority survivors’ abilities to live independently and their quality of life. The rehabilitation in hospital is extremly expensive and cannot be covered by medical insurance. What we are doing is to provide them possible low cost solution, which is a home-based rehabilitation system. 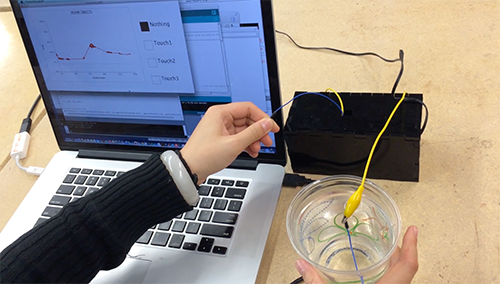 These two are using different way to realize gesture detection, touche is using capacitor change in the circuit while Touch and Activate is using frequency to detect frequency change. At first I explored “Touche”, and show it in critique, after final critique, move to “touch and activate”. “Touch and Activate” seems not work very well in noising environment even it just use high frequency (like the final demo environment). The connection between Max and Processing is not very strong. So if I want to do some complicated pattern, the signal is too weak to do that.